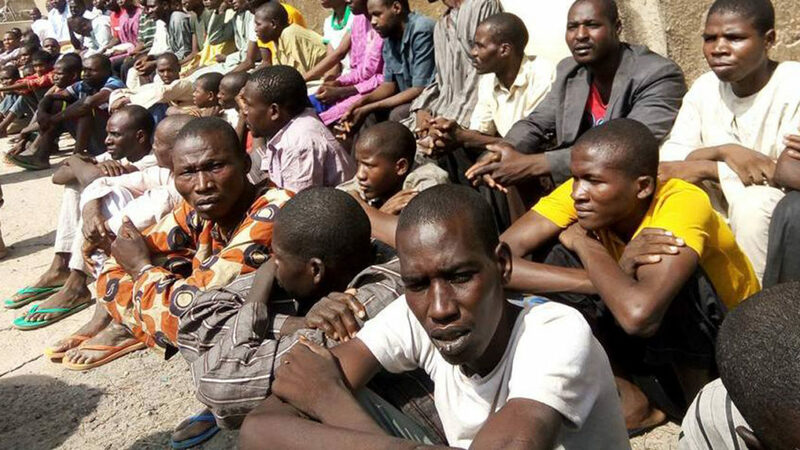 Three hundred Boko Haram suspects who were due in court on Tuesday will now have to wait until at least next month to learn when they will be formally tried. The individuals were remanded in custody for 90 days on October 10 by a civilian court set up at a military base in central Nigeria. “The case was slated for resumption today (Tuesday) but it has been postponed to February. No date has been fixed yet,” a justice ministry source told AFP. “The law allows for an extension of the remand order for another 90 days, so we are still within the limit provided by the law. “There are ongoing investigations into the individual cases of the suspects and these investigations have not been concluded. Nigeria began the first mass trials linked to the Islamist insurgency in October last year, more than eight years after the start of violence that has killed at least 20,000. Human rights groups have accused the military of arbitrarily arresting thousands of civilians and holding them in unsanitary conditions and without access to lawyers. The prosecutions were welcomed but the government was criticised for ordering the hearings to be held behind closed doors, with the media and public banned. Four civilian courts have been set up at a military base in Kainji, in Niger state, to try 1,669 suspects. The government said on October 13 that 45 people were convicted and sentenced to between three and 31 years in jail but gave no further details.